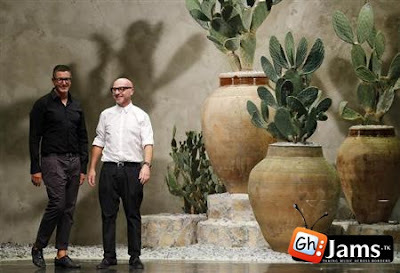 Home / fashion / news / #GJNEWS: Fashion Giants D & G sentenced to Prison. #GJNEWS: Fashion Giants D & G sentenced to Prison. months for hiding hundreds of millions of euros from the tax authorities. The designers, who are nearly as famous as the stars they dress, were not present in court in Milan and have denied the charges. Given the complexity and length of the appeals process, they are unlikely to spend any time in jail. Public prosecutor Gaetano Ruta had asked for two and a half years. The judge gave them a suspended sentence. The case dates back to an investigation that began in 2008, when authorities unleashed a tax avoidance crackdown as the financial crisis began to bite. But the probe that ensnared the two designers is one of the few high-profile cases to come to trial so far. The pair have always said they are innocent. "Everyone knows that we haven't done anything," Gabbana tweeted in June 2012 after the trial was ordered. But Gabbana's only reaction so far on Wednesday was to tweet a close up photograph of the branch of a colorful citrus tree, just seconds after the verdict.